John Pollock runs through the WWE's Starrcade-themed house show that aired on Sunday on the WWE Network featuring AJ Styles vs. Samoa Joe in a steel cage match. 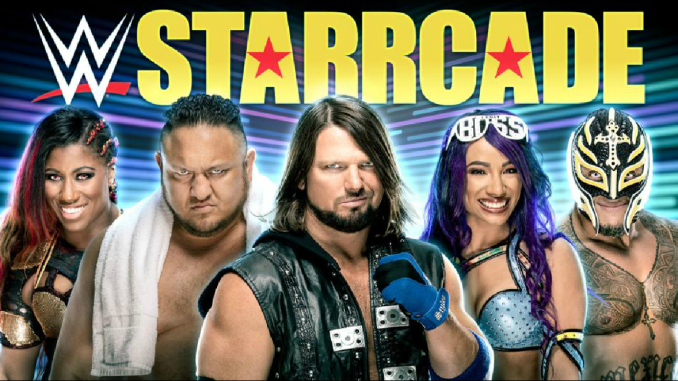 Starrcade was taped Saturday night at the U.S. Bank Arena in Cincinnati, Ohio and edited down to a one-hour version that ran Sunday night on the WWE Network. The show is being called by Tom Phillips and Byron Saxton. The show began with Elias in the ring playing the guitar. After playing, he introduced Ric Flair. He said he has been dying to walk with Elias and honored to be in the WWE and here with Elias. They were going to sing together but were interrupted by Nia Jax, Tamina, Mickie James & Alicia Fox. Elias began singing and was stopped by Nia screeching and acting obnoxious. Elias told her to shut her mouth and called four of his friends to come out and set up the eight-woman tag match. Nia Jax and Tamina double teamed Bayley and got the advantage on her. It built to a hot tag to Banks. Moon came off the top and hit the Eclipse onto Tamina. Bayley hit a top rope elbow to the back of Jax’s head and allowed Banks to apply the Bank Statement to Fox after countering a roll-up attempt for the submission at 6:46. This was a shorter match than you would see on Raw. The noticeable aspect was how much the audience cheered for the babyfaces and booed the heels. It didn’t have much time but was average. Samoa Joe cut a promo for YouTube on AJ Styles. He mentioned the definition of insanity of doing the same thing over with the same results. But, he’s not insane, Styles is because each time he loses a piece of himself when he fights Joe. He’s facing an AJ Styles that lost a lot recently and the definition of insanity is stepping into the cage with him and expecting to walk out. The Miz was in the ring for Miz TV, he mentioned the historical matches in Starrcade history with Ric Flair vs. Harley Race, Greg Valentine vs. Roddy Piper, Lex Luger vs. Dusty Rhodes and segued by stating his two guests would be fighting for the United States title as he brought on Rey Mysterio and Shinsuke Nakamura. Phillips mentioned Mysterio competed on the final Starrcade event in 2000 (in a Bunkhouse Brawl with Konnan and Billy Kidman against Jeff Jarrett and The Harris Boys). Mysterio came out wearing a neck brace from Randy Orton’s attack on SmackDown, unlike Ronda Rousey on Raw. Mysterio said he was here because Starrcade holds a special place in his heart. Mysterio rattled off names from the past just like Miz did, but also mentioned Sting and Eddie Guerrero. Nakamura couldn’t understand Miz and thought he said “arcade” when he said “Starrcade”. He said he doesn’t care about Starrcade or Rey Mysterio. He loved watching Randy Orton “get evil on him”. Nakamura attacked Mysterio and removed the neck brace. Mysterio countered the Kinshasa with a roll up for a two-count at the start of the match. Mysterio hit the seated senton and set up Nakamura for the 619, but Miz tripped Mysterio from the floor (he’s a heel on this show) and the match ended at 2:10 with Mysterio winning by disqualification. Rusev ran down and sent Nakamura to the floor. Lana suggested a tag match and they made the challenge. Nakamura and Miz got the heat on Mysterio in their corner. He tried to get to Rusev and was dragged back by Nakamura. Mysterio kicked him off and tagged Rusev. Rusev missed with the Machka kick, he blocked the Skull Crushing Finale and dropped Miz with a head kick. Rusev went for the Accolade, was distracted by Nakamura on the apron and led to the Skull Crushing Finale being hit and Mysterio saved his partner. Mysterio hit a 619 to both Nakamura and Miz. Rusev nailed Miz with the Machka kick and pinned The Miz at 6:08. This was a short, but fun tag match and Mysterio and Rusev worked well as a babyface act together. The pacing of this show is so fast compared to a regular WWE show. Styles received a loud reaction coming out. Joe took control, by launching Styles into the cage repeatedly. Joe attacked Styles, including an enzuigiri into the corner. Joe had an existing cut over his right eye and it was opened. Styles fought back, he attempted a flying forearm off the top turnbuckle and was caught with a belly-to-belly suplex. Later, Styles tried for a Styles Clash and that was stopped and hit with a senton. Styles responding by clipping the left knee of Joe. Styles applied the calf crusher and Joe tapped at 11:56. They didn’t have a pay-per-view level match or anything close but was a fine main event and played off the past matches involving Joe’s knee, that was the target in the Super Show-Down match in October. This was hardly a show you needed to see as it had zero storyline implications and was just house show matches. That said, it breezed by and as a concept, I think this is something they could do every now and then. It would work for a big Madison Square Garden house or something that has a hook attached to it. The idea of doing these weekly, or even monthly, seems too often. I also felt the one-hour format worked best because I wouldn’t have dedicated three hours to watching a house show.